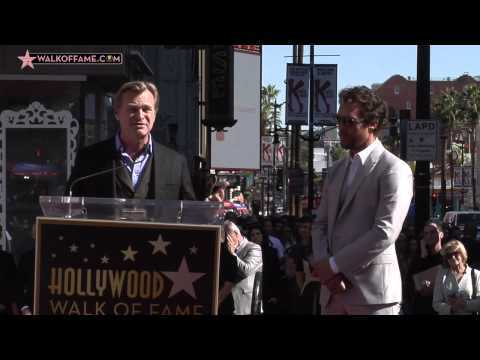 Watch Matthew McConaughey Hollywood Walk of Fame star ceremony below. The Hollywood Chamber of Commerce proudly honored award winning actor Matthew McConaughey with the 2,534th star on the Hollywood Walk of Fame on Monday, November 17, 2014 at 11:30 a.m. The star in the category of motion pictures was unveiled in front of Madame Tussauds Hollywood at 6931 Hollywood Boulevard. “Matthew McConaughey is one of Hollywood’s most popular leading men and the community of Hollywood is proud to place his star on our famed historic Hollywood Walk of Fame,” stated Ana Martinez, producer of the Walk of Fame ceremonies. Texas native Matthew McConaughey began his career with a chance meeting in Austin with casting director and producer Don Phillips who led him to director Richard Linklater, who later launched the actor’s career in the cult classic “Dazed and Confused.” Since then, he has appeared in over 40 feature films that have grossed over $1 billion; and has become a producer, director, and philanthropist – all the while sticking to his Texas roots and “jk livin” philosophy. 2014 has been a game changing year for McConaughey. He has received numerous awards and accolades for the critically acclaimed “Dallas Buyers Club” for which he dropped 47 pounds to play to role of AIDS stricken Ron Woodruff. The film was directed by Jean Marc Valle and also stars Jennifer Garner and Jared Leto. For his riveting portrayal McConaughey received an Academy Award®, Golden Globe Award, Screen Actors Guild Award and Gotham Award for Best Actor, the Best Actor Award at the Rome Film Festival as well as the Desert Palm Achievement Actor Award at the Palm Springs Film Festival. McConaughey currently stars in the recently released Paramount Pictures film “Interstellar,” directed by Christopher Nolan and in theatres now. In 2012 McConaughey was spotlighted in four diverse career changing performances. He won a Spirit Award for his portrayal of Dallas Rising in Steven Soderbergh’s “Magic Mike,” and was named the year’s Best Supporting Actor by both the New York Film Critics Circle and the National Society of Film Critics for his work in “Magic Mike” and Richard Linklater’s “Bernie.” McConaughey also received acclaim for his performance in Lee Daniels’ “The Paperboy,” and was a Spirit Award nominee for playing the title role in William Friedkin’s “Killer Joe.” He followed this up in 2013 with the release of Jeff Nichols’ “Mud,” which received rave reviews and was a sleeper hit in the national box office top 10 for five weeks and Martin Scorsese’s “The Wolf of Wall Street,” which opened in December 2013. He made the move to TV starring alongside Woody Harrelson in the HBO dramatic series “True Detective.” The show has been met by rave reviews from critics and fans alike and earned him a Critics Choice and TCA Award for Best Actor in a Drama Series as well as an Emmy Nomination. In 2008, McConaughey started The just keep livin Foundation (www.jklivinfoundation.org), which is dedicated to helping boys and girls transform into men and women through programs that teach the importance of decision-making, health, education, and active living. The Foundation has partnered with Communities in Schools (CIS) – the nation’s largest, non-profit, dropout-prevention organization –in West Los Angeles to implement fitness and wellness programs in two large urban high schools. Through an afterschool program, they are able to give kids a healthy start in life and the promise of a healthy future. The Hollywood Walk of Fame is an internationally-recognized Hollywood icon. With approximately 24 star ceremonies annually broadcast around the world, the constant reinforcement provided to the public has made the Walk of Fame a top visitor attraction. The Hollywood Chamber of Commerce continues to add stars on the Walk of Fame as the representative of the City of Los Angeles. The Walk of Fame is a tribute to all of those who worked diligently to develop the concept and to maintain this world-class tourist attraction. The Walk of Fame is open to the public. No paid admission or assigned seating at star ceremonies.It is understood that the cost of installing a star on the Walk of Fame upon approval is $30,000 and the sponsor of the nominee accepts the responsibility for arranging for payment to the Hollywood Historic Trust, a 501(c)3 charitable foundation. The funds are used to pay for the creation/installation of the star and ceremony, as well as maintenance of the Walk of Fame. The Official Hollywood Walk of Fame App is now available in the iTunes Store: https://itunes.apple.com/us/app/official-hollywood-walk-fame/id725209617?mt=8. The Android version will premiere later this year.